John Stossel on being a Libertarian and a journalist, the issues of capitalism, morals and the role of government. Stossel took a non-traditional route to becoming a journalist. After college, he postponed going to graduate school and took any job he was offered. He ended up working for various news and consumer research agencies and ended up working on ABC and now Fox. He has won 19 Emmys. Stossel also pointed out that one of the contributing factors to his success is his firm belief in libertarian ideals. D’Souza pressed Stossel on morality and libertarianism. 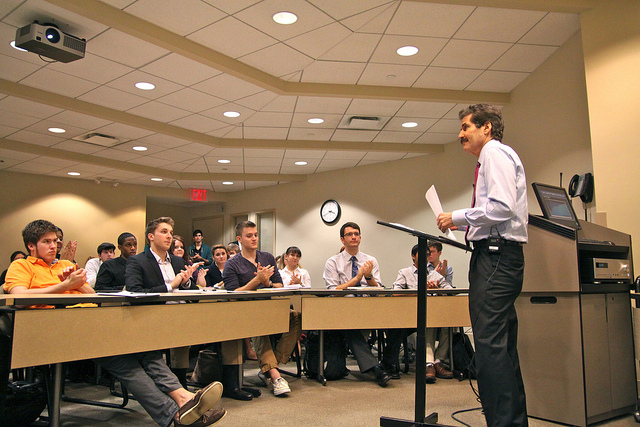 “There is a tension between morality and freedom,” Stossel said. It is this tension that fuels the opposition of the libertarian party. While a libertarian society allows for as much freedom as possible, there is unarguable social damage that can be attributed to letting individuals have free range over their actions (within reason). Luke: Thank you so much for your time today and for meeting with us. To start out, I think a lot of King’s students who are looking into journalism might feel intimidated by that particular job field. So what would you say a student could do now to prepare to go into a career, in today’s media, if they are conservative or libertarian? Stossel: Well obviously there are conservative outlets in the media, or you could go and try and infiltrate the left wing. If you can try and argue that there are people who see things from your perspective and get to say what you believe, then good for you. Luke: What kind of specific opposition have you met being a libertarian in the media? Stossel: I’ve been told I’m predictable and that it's tedious. I did this show called "Stupid in America" that dealt with K-12 education government monopoly and it rated really well. So a few years later when there was a whole school choice movement that had developed since then, I wanted to do an update. But they told me I was predictable, and that they were not interested. When Obamacare began, I wanted to do a piece on Michael Moore’s Sicko and how his assumptions about Cuban healthcare were incorrect; they just were not interested. It’s not so much overt agument, it’s more of a blank stare. Unless it fits their bias, it’s very hard to get something on air. We then asked him about the role of government and how a libertarian view can be applied to ethics on a college campus such as King's. Meredith: Mr. Stossel, do you think that the role of government is to monitor individual citizens as part of the whole, or to work for self-preservation and make policies for the continuity of the system? Stossel: Well, you need preservation of the government. It is responsible for making sure that people don’t kill each other or take each other’s stuff. I think there can also be some environmental policies. But as far as morality goes, no, I don’t think the government should intervene. Meredith: So basically people should be able to act on their individual freedom without government intervention. Stossel: Exactly. People, meaning adults, should be able to do what they want with their bodies, actions, money and moralities as long as they are not hurting someone else. The government shouldn’t be able to regulate morality on a federal level. Now here at a university, the college can make regulations, and that’s fine. It’s a private institution. But the federal government shouldn’t have that ability. Luke: On the subject of college regulations, here at King’s we don’t have a specific list of behavioral codes. We are on an honor-bound system. However, students still have freedom to an extent. So what would your definition of student freedom be? Stossel: In a private school, the institution has the right to make the rules they want, and if you don’t like it you don’t have to go here. People can move or change their behaviors. If you think that something is really unjust, you can protest it, but if you don’t like something at the school, the school, if it’s private, doesn’t necessarily have to change.